Valletta claimed another three points to make sure of staying on top the BOV Premier League as they defeated Qormi 2-1 at the National Stadium on Friday. Many would have expected a more comfortable win for the Citizens but Qormi gave a very good account of themselves, especially during the second half after they had reduced the gap just before half-time. 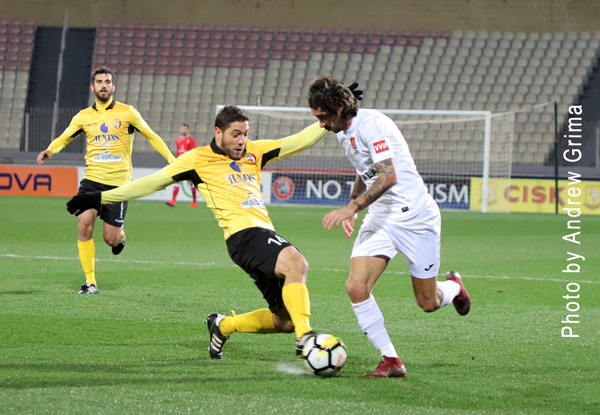 Qormi’s Mario Muscat opted for two changes despite the win over Pietà Hotpsurs last week as Freud Gnindokponou and Kassiano Soares made way for Lucas Santana and Wellington de Oliveira. On the other hand, Danilo Doncic named an unchanged line-up after the 2-0 win over rivals Birkirkara. Valletta took the lead on the 24th minute when off a cross by Rowen Muscat, Miguel Angel Alba controlled before beating David Cassar with a diagonal cross from the right. Four minutes later, the Citizens doubled the score when off a cross by Enmy Pena Beltre, Bojan Kaljevic’s first-time effort saw the ball hit the crossbar before ending at the back of the net. One minute from half-time, Qormi pulled one back when Mohamed Bangoura took advantage of a mix-up between goalkeeper Henry Bonello and Steve Borg, finding no difficulty in tapping the ball home from close range. QORMI David Cassar, Davide Mansi, Yannick Yankam, Antonio Rozzi, Manolito Micallef, Alan Abela, Wellington De Oliveira (80′ Iven Zammit), Jordy Lokando, Mohamed Bangoura, Lucas Santana, Romeu Romao. Subs not used: Miguel Falzon, Michael Borg, Alessio Cassar, Nick Ghio, Luke Busuttil, Leon Theuma. VALLETTA Henry Bonello, Steve Borg, Ryan Camilleri, Santiago Malano, Matteo Piciollo (66’ Bogdan Gavrila), Enmy Pena Beltre, Joseph Zerafa, Rowen Muscat, Miguel Angel Alba (77′ Jonathan Caruana), Bojan Kaljevic, Mario Fontanella (89′ Jean Borg). Subs not used: Yenz Cini, Jonathan Caruana, Shaun Dimech, Kyrian Nwoko, Nicholas Pulis.